This was an accidental experiment involving two closely bonded cats. 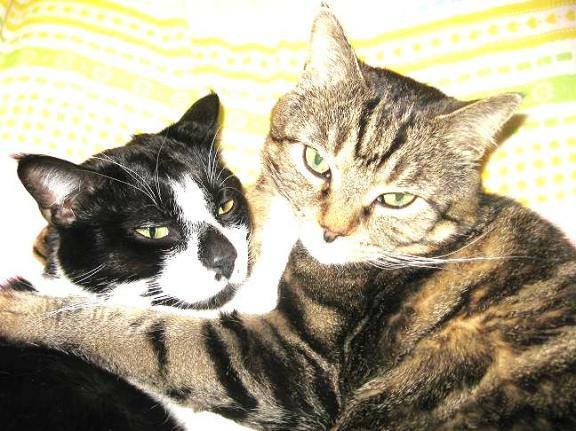 My wife Deanna Krantz had rescued these two cats from the Minnesota winter four years prior to this incident. truly feral, estimated age 4-5 years, and had survived more than one winter in our neighborhood according to neighbors. We neutered, vaccinated and treated him for parasites and he was slowly socialized over many weeks in a spare room in our house . Mr. Mark Twain showing terror when first captured, then giving love eyes a year later. 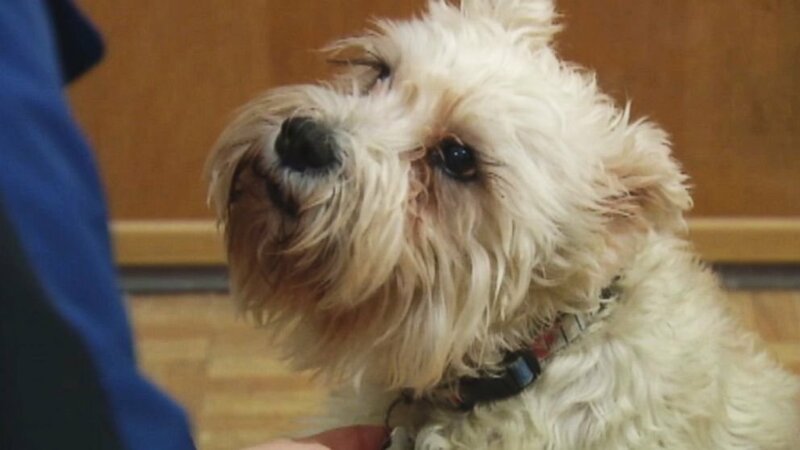 Being groomed and eventually enjoying massage therapy helped Twain establish a bond of trust and mutual affection. Mr. Pinto Bean (Pinto) was similarly food-lured and eventually caught in a humane trap as Twain had been some two months earlier. Black and white Pinto was estimated to be around 1 year of age, more a lost stray than fully feral cat. He was also neutered, vaccinated, treated for parasites and kept in an area separated from Twain by a barrier, the plan being to gradually socialize the cats with each other. But Pinto broke through the barrier and was found amicably beside Twain who rapidly became more approachable and sought ever more contact with his human care-givers, as did Pinto. Pinto, over several days, was given food closer and closer to the trap. These two cats soon became the best of friends, longer-limbed Pinto learning not to scratch and injure Twain during play-fighting, neither of them being de-clawed. Pinto never lost his fear of strangers, always hiding when people entered the house. Twain was more sociable, occasionally soliciting being touched by visitors. 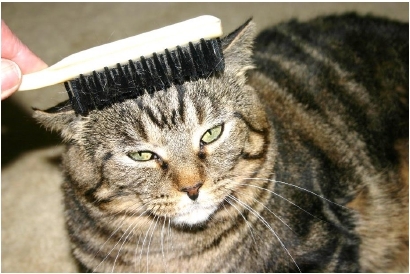 Pinto was addicted to food, Twain to being stroked and brushed. 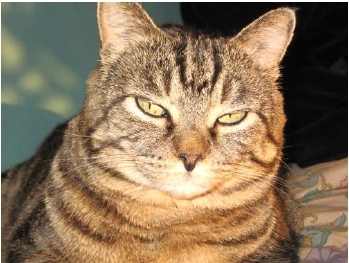 Twain would hiss and flee when accidentally disturbed while eating or when in the litter box--situations where he must have felt most vulnerable and to which he never habituated. 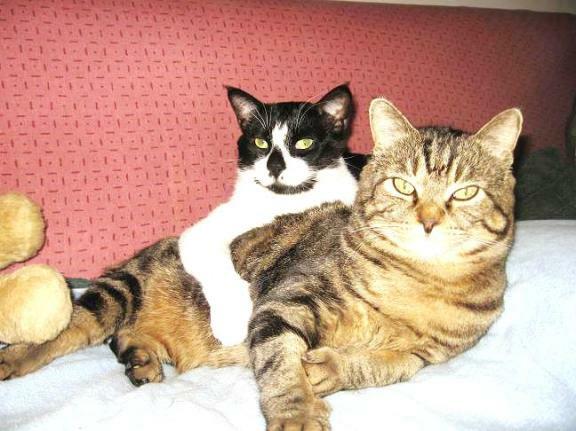 The two of them enjoyed engaging in mutual grooming, sleeping together and on occasion Pinto would straddle Twain to ‘nurse’ on Twain’s back or neck. Then on the evening of April 6th 2014 while being habituated to a cat harness on our walk-out deck, Twain panicked, broke out of the harness and fled. During our vigil of 12 nights and 13 days Twain occasionally returned to the deck for food but was too fearful to enter our home through the open sliding glass door, and too shy to submit to being picked up. But he was eventually caught when he came to be brushed at 4.30 am on his 13th day outdoors where at night the temperature fell below freezing and there was a heavy snow storm in the middle of his exodus. Pinto was clearly depressed when Twain was gone, searching the house for him and looking though all the windows for several days. 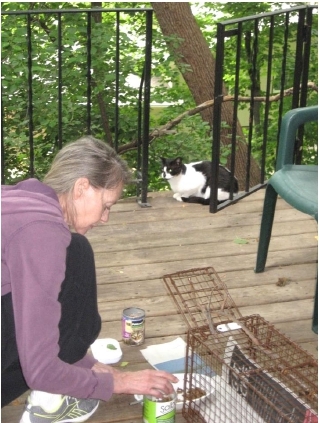 But on two occasions when he saw Twain on the deck eating food, he hissed, puffed out his tail and gave low yowl-growls as he had done on several occasions before when he saw a stray/feral cat outdoors ( three of which we trapped and sent to local re-homingcat adoption shelters). as evidence of cognitive disassociation. In the cat’s mind, or at least in the minds of many cats, especially those who are more fearful/feral, they recognize others as non-threatening, friends/conspecifics in the holistic context of place/situation. Seen in another place/situation, context changes identity/recognition. Social recognition for cats may also involve multiple sensory inputs, auditory and olfactory as well as visual, a ‘gestalt’ perception. Any alteration in these input modalities, as caused by a barrier, (window or sliding door), change in familiar scent/body odor or in familiar range of vocalizations and movements/body posture ( as from relaxed to tense and fearful) could affect social recognition, making the familiar unfamiliar. 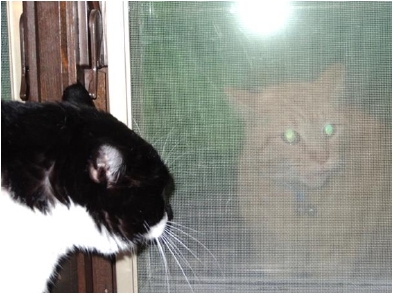 Pinto threatens a free-roaming cat through window screen. The rescue of Twain became an accidental experiment when Pinto ran out of the open sliding door while Twain was in the process of being solicited to approach, be groomed and then successfully seized and carried indoors. Twain’s physical condition was one of evident near-starvation, but once inside he had little appetite and kept searching and calling for Pinto. Pinto was lured back indoors with food three nights later. He attacked Twain—a fur-pulling rather than deep bite and scratch event. Both cats avoided each other and spent long hours in deep sleep during their initial recovery, with more evident dream activity (REM sleep) during their initial recovery. Twain’s appetite returned and he would stare at Pinto and on occasion block his path. Pinto would then hiss and slink away in fear, even after making brief nose-to-nose contact. I interpret Pinto’s behavior as evidence of post- traumatic stress disorder. The two cats began sleeping together again. On the seventh day of being reunited they were more amicably eating and sleeping together, but Pinto was still avoiding Twain’s attempts to solicit reciprocal grooming and play. 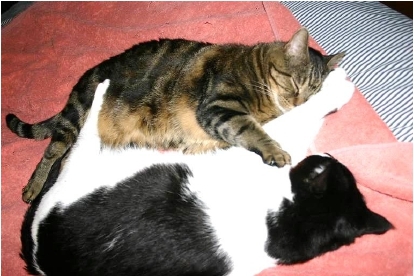 Pinto’s slow recovery, which we sought to facilitate with food treats for both cats, brushing them in turn and engaging in interactive games, was eventually accomplished. This took ten days after the cats were reunited, marked by two brief episodes of reciprocal grooming followed by play-fighting. On the thirteenth night of their reunion, after a long bout of reciprocal grooming and play-fighting, Twain relaxed and allowed Pinto to half-mount his back and engage in nursing/suckling behavior. Twain seizes Pinto for a thorough grooming. Pinto reciprocates social grooming and then nurses on Twain's back. Letters received from readers Fox';s syndicated "Animal Doctor" newspaper column add more light on the feline psyche. For instance, some cats become hyper-vigilant and even aggressive when handled without caution when taken out for a walk on a leash and in a secure harness (plus additional collar we now advise). Then there are those cats returning from a short stay at a veterinary hospital or boarding facility who are feared and avoided or attacked by one or more of their familiar in-home cats. Taking the basic steps of introducing a new cat into the home (as posted on www.drfoxvet.com) may be advisable after immediately separating the cats to prevent injury and sustained conditioned avoidance behavior. This accidental experiment with our own two cats has sensitized us to the delicate, and seemingly irrational/aberrant cognitive and socio-emotional processes and dynamics of the domestic cat, Felis domestica. We would call our magnificent, Buddha-natured Mr. Mark Twain, survivor of more than one Minnesota winter, Felis feralis-domestica. This is because he is still somewhat feral. For instance, while he lets us pet and kiss him on his tummy and makes trembling contact with his laser-like claws on our arms and cheeks, he flees when there is any sudden noise or unanticipated movement, and has a limited tolerance to being held for more than a few seconds. Some house cats, like Twain, walk more on the wild side than others. But many so called pure breeds are now suffering the adverse consequences of selective breeding on their physical, physiological and psychological makeup and well-being, all too often compounded by a dispirited existence with no feline companionship, being alone all day during the work-week, and left with a dry food dispenser when their human companions go away for the weekend. To live with a cat one must learn to be a cat: But for the good of the cat, consider the animal's need for the companionship of another compatible feline which, no matter how well we may love and try, we cannot ever fully replace with ourselves because we are only human after all. Many people don't know how to properly and safely restrain terrified cats, which can be a problem with staff in animal shelters and even veterinary hospitals (leading some of the latter to advocate the de-clawing of cats to make them easier and less injurious to handle). Pinto & Twain: Best of friends again. Author Fox writes the nationally syndicated newspaper column "Animal Doctor" and published the best-selling books "Understanding Your Cat" and "Supercat: How to Raise the Perfect Feline Companion". Deanna Krantz is founder & director of India Project for Animals & Nature with Global Communications for Conservation Inc. NY. Website: www.drfoxvet.com.